Came across a YouTube thumbnail you’d love to save but do not know how to do that? Here, we’ve got some free tools to help you grab YouTube thumbnails quickly. Typically, YouTube thumbnails are created to explain the supposed video/clip at a glance. Most of these YouTube thumbnails are funny, educative, creative, and all. This may call for someone to think of saving them to an alternative storage disk. Even bloggers that wishes to create review content for a particular video can use this method to grab the video thumbnails for post publication. Here, we’ve got you covered by listing the 15 free tools and method(s) you can use to grab YouTube thumbnails quickly and in a high-resolution. They are the top best free and easy YouTube thumbnail grabbing methods that any internet user can make do with irrespective of their knowledge level. Copy the YouTube video link and paste in the search box. Select the Image quality you want and save the thumbnail to your local storage drive. One of the most interesting features of this tool is that it allows one to capture real-time screenshots from a playing YouTube video. It is arguably one of the best YouTube Thumbnails Grabber and ScreenShot taker. The mode of operation of this YouTube thumbnail grabber is quite unique, although still very easy to use. You also get to see other people’s recent grabs and you can equally save them if you want. All you need to do is to visit the website and paste the YouTube video link on the provided URL bar. Once you have pasted the URL, wait for the page to refresh and offer you the video thumbnail in different resolutions. This is a custom web tool that lets you download and save any YouTube video thumbnails quickly. 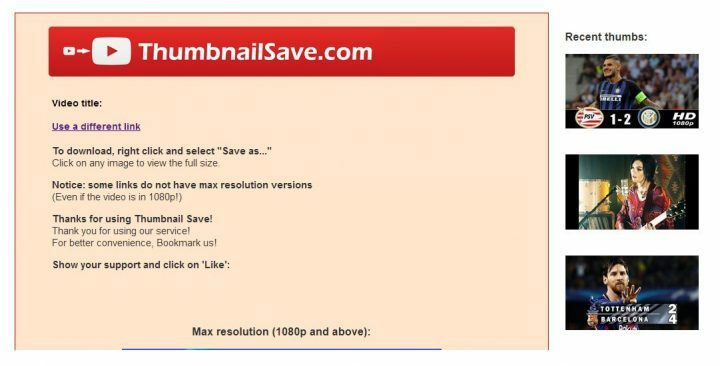 There is no limit to the number of video thumbnails you can save with this tool. All you need is an active internet service that would not disappoint. The Get YouTube Video Thumbnail has an intuitive website interface: you don’t really need a guide to start exploring the features of this simple YouTube thumbnails downloader tool. Here is a very powerful Youtube thumbnail image grabber. 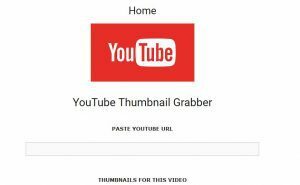 With this great utility tool, you can easily get any Youtube thumbnail you wish to grab. This tool (just like iTube studio that lets you download YouTube videos to Mac) is easy to use and has a very intuitive web interface for seamless navigation. There are other useful YouTube-tailored functions on Get YouTube Thumbnail Image website. Play the Youtube video and immediately the thumbnail appears, pause the video. Now, click on the “Snipping Tool” icon (usually at the taskbar). Select the region of the video thumbnail and save to any location of your choice. Note: You can also get access to the snipping tool by searching from start menu programs. Even videos that are Downloaded from YouTube to the PC can be grabbed w/ snipping tool while playing. Alternatively, you can use the PrintScreen (prt sc) option on your keyboard to grab YouTube thumbnails. Typically, when you press the Prt. Sc button on your keyboard it captures everything on display on your screen and copies it to the clipboard. So, when you use this option to grab Youtube thumbnails, you’d have to open any image processing app/software and paste (ctr+p) the copied image, then save to your local storage drive. Also, you have to play the YouTube video in “Full Screen” view if this is the option you wish to use. Default Windows Apps like Wordpad, paint and free editors can come in handy for this method of YouTube thumbnail grabbing. This tool works in a very easy way. All you’d need do is – just copy the video URL and paste it inside the search box space provided. Then, the tool fetches out the thumbnails automatically for you to choose the thumbnail resolution and save in your preferred location. The name already tells you the function. This online tool is an effective YouTube video thumbnail grabber. It features a plain, intuitive interface, and does not only support YouTube thumbnail grabbing but has support for other services too. It lets you grab Vimeo video thumbnails and that of DailyMotion, Metacafe, Break, and WorldStarHipHop. Most people who grab Youtube thumbnails use this premium tool. Yeah, it is premium but free to use. The YouTube Thumbnail Grabber works in a simple way that everyone can comprehend. All you need to do is copy the Youtube video URL and paste into the box, the video thumbnails will appear automatically. Select your preferred image resolution and save to your desktop or to a USB flash disk. Here’s another interesting unique tool for getting thumbnails of any Youtube video. If you’re looking for a free online tool for grabbing YouTube thumbnails, this is a perfect option. It does not only download YouTube video thumbnails, but that of Vimeo as well. Copy and Paste Youtube video URL. Click on ”Get Thumbnail” and wait for a few seconds. Youtube Thumbnail is ready for download. Right click on the image resolution you like and choose a place to save it for latter use. 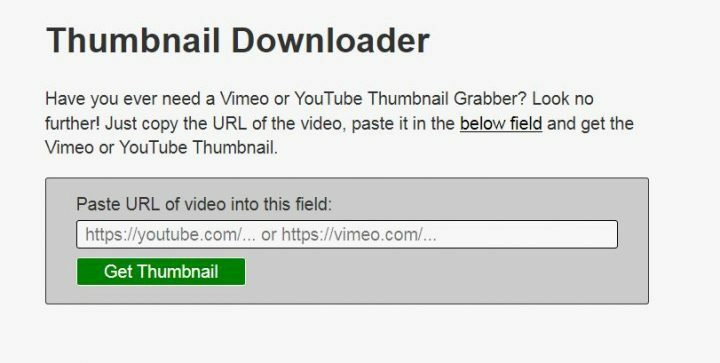 Now, it’s easier to view or download the image thumbnail of your favorite YouTube video using this handy YouTube Thumbnail Grabber. It works in just in two easy steps. Select the image quality of your choice and right-click to save. 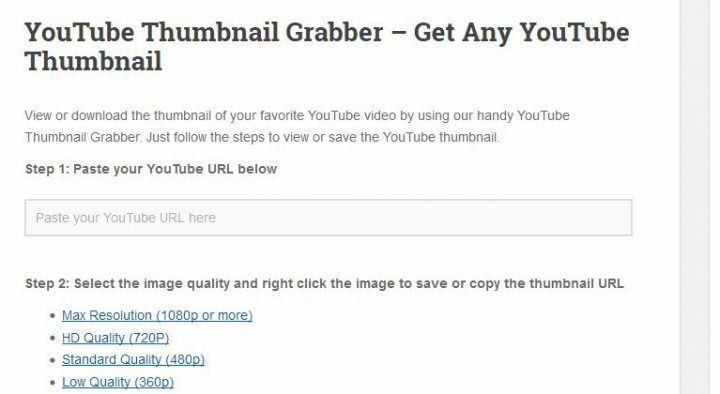 Using this effective thumbnail grabbing tool will allow you to get out any YouTube video thumbnail without much stress/effort. This YouTube Thumbnail Downloader is super intuitive and delivers the image (thumbnail) to you in various quality (resolutions). This is one of the best free tools for downloading Youtube video thumbnails. It works effectively for this function and it very easy in the way that everyone can comfortably make use of it. Even though it’s no different from the other free tools and methods listed above, the fast thumbnail grabbing feature has made it one of my favorite video thumbnail grabbing tool. 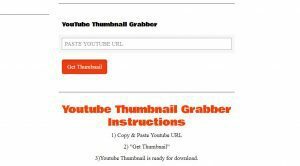 Youtube Thumbnail Download is a completely free tool to download and save YouTube Video’s thumbnails. The Good thing about YouTube thumbnail saver is that – it would normally fetch the video thumbnails from YouTube servers and provides you with downloadable images. Your only work is to copy the video URL and save the corresponding image in any resolution you choose. These are hands down the best YouTube thumbnail grabbing tools for everyday users. The best part of it is – they are free and comes with no limitation. High resolution YouTube video images can be saved with most of these tools. Did we miss any of your favorite YouTube thumbnail grabber? Please tell us about it in the comments section below.